Just a note, I'm going to stick to 'handbags' and exclude clutches or anything too small to carry a wallet, phone, camera, keys, and other necessary daily accessories. Which is your favorite?? Do you have a favorite Grey Bag that I missed?? Please share the link in the comments below! I like the Marc Jacobs Classic Q satchel and the Minkoff studded ones.. I have never spent that much on a bag though. I sooo would love one. I have been thinking of getting rid of any bags I have now that I don't use very much so that I can start buying new ones based on the fact that I would use it all the time. I like the Classic Q Satchel mainly because the 'I.D' tag isn't plastered onto the front of the bag, like most of the current MbyMJs. My RM MAM is the most expensive bag I have and it was just over $300. If you find a bag you like do your homework. So many sites have non advertised coupon codes, or you may be able to find the bag at a website like shopbop.com vs. bloomingdales. Also, eBay is always worth looking at, but make sure the seller has high ratings, the pictures are of the actual item (not stock photos) and don't be afraid to ask questions. A good seller won't hestitate to take different pictures or give you a straight answers about condition, etc. I love you so much for this post. and that you spell it "grey." 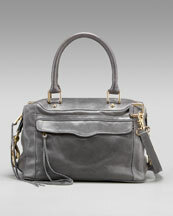 I am LOVING the Alloy Keri Hobo, and since it's very much in my price range, I might just pick it up. You have awesome taste! PS I didn't know you have a Boston - I have 2, love these dogs So.Much. lol. Do it Mandee, Do it! and 10years - thank you, thank you very much (in my Michael Scott impersonation of his Elvis impersonation)... and yes, our little Penny is just over a year and the loviest little lover you could ever meet!! Such a sweetheart!